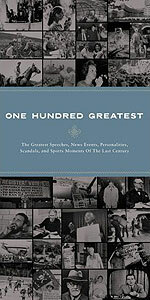 CD review: "One Hundred Greatest"
This five-disc set is really 500 great moments  100 each in news, sports and oration, plus the more nebulous categories of "personalities" and "scandals." Given that it's a collection of sound bites, the 100 in each list are by necessity limited to the era of radio and sound recording. So you won't find Abe Lincoln in the 100 greatest speeches set, nor U.S. Grant in the greatest scandals set (nor, for that matter, Benjamin Franklin on the greatest personalities disc). And even what has happened in that time is unevenly represented: The U.S. Olympic hockey victory over the Soviets is represented not by Al Michaels' classic "Do you believe in miracles?" TV play by play, but by an after-the-fact news report. And the Apollo program? Mission No. 8 gets the nod, not Neil Armstrong setting foot on the moon with Apollo 11. None of the Rev. Martin Luther King's great speeches is here, either. But the Hindenburg disaster's momentous live radio broadcast, with the reporter breaking down in tears, is here, as is President Roosevelt's "date which will live in infamy" Pearl Harbor speech, JFK's inaugural speech and President Reagan's "Mr. Gorbachev, tear down this wall" speech  goose bumps each. In a local bonus, San Diego County makes a couple of appearances  the 1984 McDonald's massacre at San Ysidro, and the guilty plea of former Rep. Randy "Duke" Cunningham to bribery and corruption charges. Regardless of an item-by-item nitpicking of what should have been here or not, the collection is a treasure trove of historic newscasts, and what is here is generally spectacular. If hearing Lou Gehrig talk about being the luckiest man alive shortly before dying from the disease that still bears his name doesn't raise the hair on your neck, you're not a sports fan. If hearing Churchill's radio broadcast rallying the British to stand up to the Nazis doesn't touch you, then you might as well save your money and not get this collection. But for most of us, having a collection like this is likely to serve as a cultural touchstone.